higher Vertical & Cross positioning accuracy Form Grinder with non hydraulic oil system. ・Vertical and Crossfeed minimum setting is 0.1μm. Precision specifications by scraping alignment for longitudinal and crossfeed slide adopted V-V sliding way. 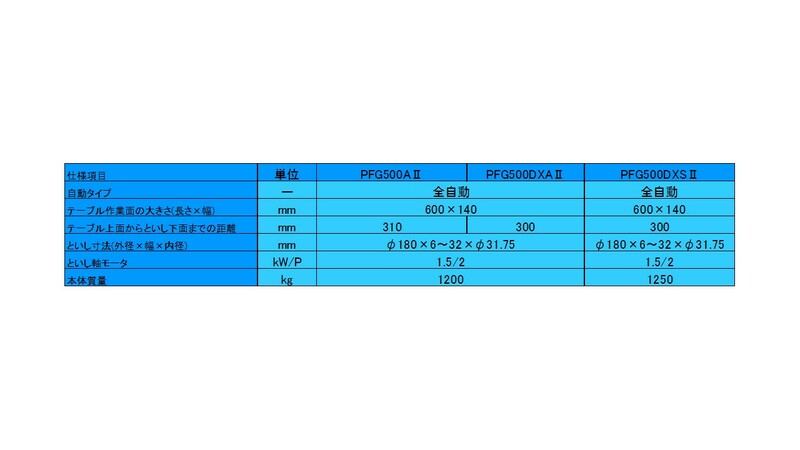 ・Rigidity ratio of grinding wheel spindle is 1.45 times conventional machine. Increase the frame size for stability of the crossfeed. ・The Linear guide construction eliminates the heat mutation oil waste and reduced CO2 emission 199.2Kg. ・Vertical and Crossfeed scale feedback is standard specification. Wheel spindle motor 2.2kW and wheel spindle inverter also standard specification. Since the MM350 is so popular, we develop a larger grinding capacity grinder for the market. ・MM415 AND MM420 model are developed to be sold as a package to reach the panncle of the traditional manual from grinding technology and accuracy. ・Comfortable wheel torque that is said to be essential in the manual form grinder, high rigidity specifications that were standard equipped with grinding wheel spindle motor of 1.5kw. And support from the high-efficiency grinding of mold parts until a fine molding. PFG450DX series has been developed as a precision form grinder of small fine shape and complex shaped parts, such as mold parts. ・Depend on the purpose. It offers three types of specifications. ・PFG450DXA is capable of the following cycle. "Coarse grinding" ⇒ "Fine grinding" ⇒ spark-out (0-5 times) ⇒ Table right end stop, comes with suitable specifications. ※Options on this machine picture are included. ・Rigid grinding wheel spindle using ultra precision grade roller bearing .minimize heat generation.Precise positioning for cross movement which is important for Forming Grinder. ・DXⅡ⇒　All manual, C type longitudinal automatic, P type vertical longitudinal automatic, A type full automatic, S ｔｙpe⇒Fully automated high speed stroke. 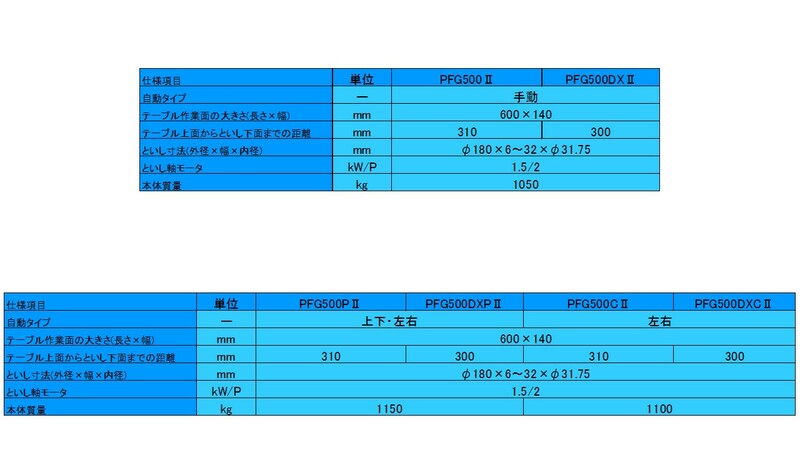 ・PFG500DXA is capable of the following cycle. "Coarse grinding" ⇒ "Fine grinding" ⇒ spark-out (0-5 times) ⇒ Table right end stop, and Vertical increment 0.1μm for Precision Forming job.